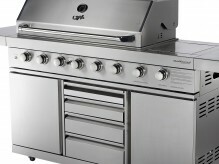 BlueTongue BBQs offer a full parts warranty on all barbeques sold. We will replace or repair (at our discretion), for a period of 24 months (12 months for bar fridges and all other electrical components), any item that is found to be faulty. The warranty does not include tarnishing or corrosion of stainless steel panels and/or parts as it is up to the individual customer to ensure that he/she provides the recommended level of care to ensure this does not occur. Please see our tips on care and maintenance for further information. The warranty does not cover the rotisserie motor unless it has been received in a non working condition. Therefore, please ensure that you test your rotisserie as soon as you receive your BBQ. Any request for replacement of a faulty rotisserie motor must be made within 7 days of delivery of your BBQ. This warranty does not cover damage due to misuse or abuse, incorrect assembly, improper handling, or accidental damage. The buyer is responsible for all postage costs incurred as a result of returning goods for warranty repair, replacement or refund. Please retain the original packaging as, in the unlikely event that the BBQ needs to be returned for repair or refund, it will reduce the likelihood of damage in transit. OzOutdoors Pty Ltd (owner of the BlueTongue BBQs and ChefMaster trade marks) will not be held responsible for any injury or death to persons or damage to property caused by the use or misuse of Blue Tongue or ChefMaster products or any other brands that the company may sell from time to time.